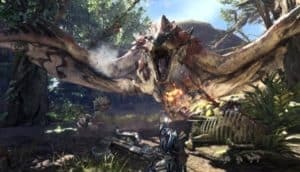 Monster Hunter: World's Free DLCs Include New Monsters | Nerd Much? "New monsters and such, to get players to play for as long as possible." In an interview with Famitsu, helpfully translated by Siliconera, Monster Hunter series producer Ryozo Tsujimoto has elaborated on the upcoming DLCs for Monster Hunter: World. It was previously revealed that the DLCs will be free, but we didn’t know what would be contained there in. With its free status, most were sure it would be nothing more than skins for the aesthetically inclined (Editor’s note: because, let’s face it, Capcom isn’t exactly the most generous publisher). Tsujimoto has stated to the contrary that the free DLCs will include “new monsters and such, to get players to play for as long as possible.” What sort of monsters we should expect was not mentioned, but the producer did promise that more will be revealed later on. As I recently pointed out, constant updates will be what defines the success of Dauntless versus Monster Hunter: World on the PC. With this new information, that competition could weigh in favor of Monster Hunter: World. Dauntless needs more time and work, whereas Monster Hunter is clearly ready to go with AAA quality. With free DLCs and useful content being added to Monster Hunter, it seems like hardly a fight anymore. That said, Dauntless will be updated long after the hype for Monster Hunter: World has died down. I really don’t see Capcom offering more than one or two DLCs after launch for the game. Such content updates will certainly not be a yearly thing like it will surely be for Dauntless. Though nothing is guaranteed and these are all speculation, I still hold a candle for the indie version. I want Dauntless to succeed, but they chose a very large pair of shoes to fill. The Monster Hunter: World beta on the PS4 just occurred this weekend, much to the delight of many fans. The maps left players wanting more and the ecosystem feels much more alive than it did previous games. Even the new weapons are well-designed and incredibly dynamic. The new monsters were equally stellar, giving old fans the thrill of challenge. Monster Hunter: World comes out January 26, 2018 on the PS4, Xbox One, and later in the year on PC.